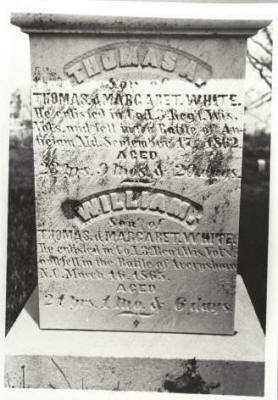 Thomas A. and William H. White were the third and fourth sons of Thomas and Margaret White. Both served in the Civil War and both lost their lives. Neither Thomas nor William married nor left children. The photograph on the left below has been in the possession of my family for well over a hundred years. On the back is the notation "? 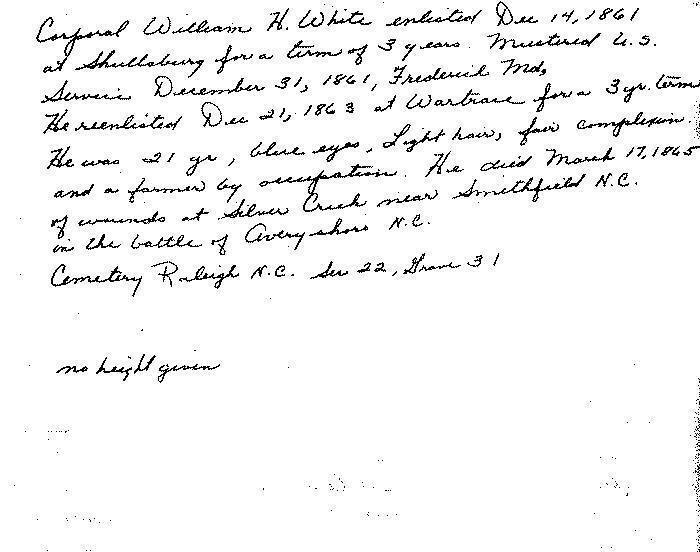 White Civil War Vet Buried in Shullsburg".3 (Kenneth White, confirmed about 1970 that the handwriting was that of his uncle, Allen Whitford White (Thomas William White/John White/Thomas White.) 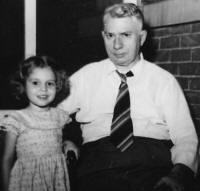 Most certainly the young man in the picture is either Thomas or William White, though admittedly, both men's papers describe them as having light or blond hair. To the right is a photo of a memorial marker for Thomas and William White which is in the Eastern White Oak Cemetery in Lafayette County.4 Contrary to the notation on the photograph, Thomas A. White was buried in the Cemetery in Antietam, MD in Lot A, Section 15, Grave 29.5 William H. White is buried in the Raleigh, NC cemetery, Section 22, Grave 31.6 I heard a rumor once that Thomas White had had one or both of the bodies moved to White Oak Cemetery but I have not seen any evidence of that. Click on thumbnails to enlarge and view original research notes made by Eileen Wendt at the Wisconsin Historical Society Archives. 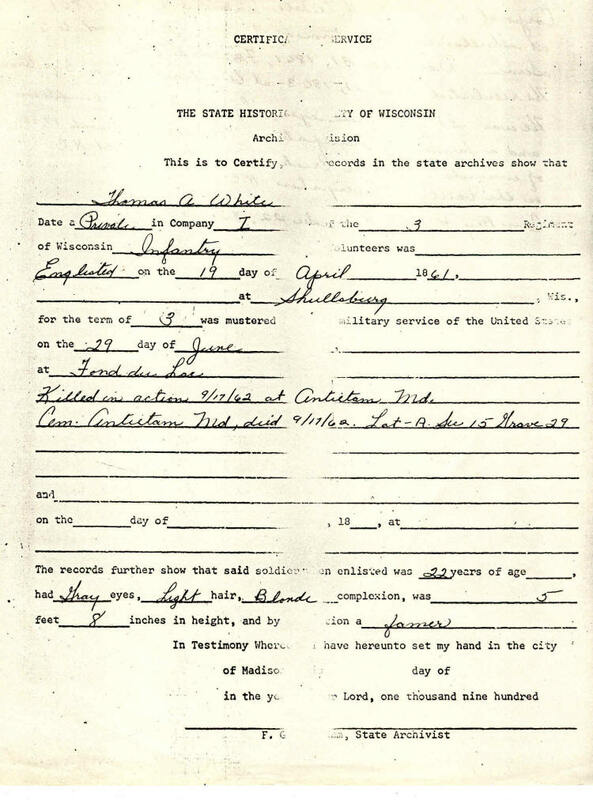 1) Information about Thomas A White in this paragraph is from a handwritten form containing information extracted from The State Historical Society of Wisconsin archives by Eileen Wendt of Stoughton, WI. It was among a group of papers given to me in 1981 by Eileen Wendt of Stoughton, WI. A scan of the form can be seen by clicking on the thumbnail on the left entitled Thomas A. 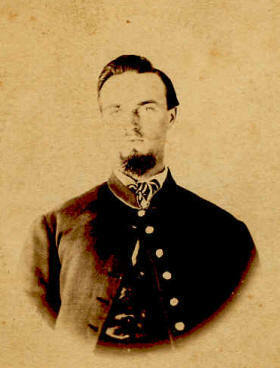 White, Civil War Service. 4) Thomas and William White memorial marker, Eastern White Oak Cemetery, Lafayette County, Wisconsin, photographed December 1981 by Nancy Custer. 5) Wendt, Thomas A. 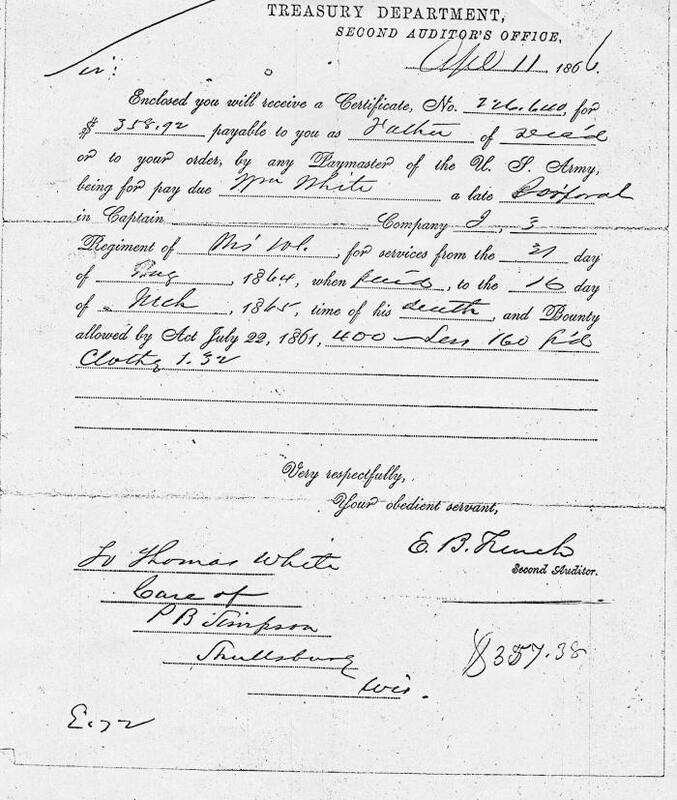 White Civil War Service Notes from Wisconsin State Historical Society Archives. 6) Wendt, William H. White Civil War Service Notes from Wisconsin State Historical Society Archives.